Tax advantages for health benefits, retirement contributions, and mortgage interest may come under Congressional scrutiny this year as lawmakers focus on tax reform. In its recent report,the JCT calculates the amount of revenue presumably “lost” because of these preferences. 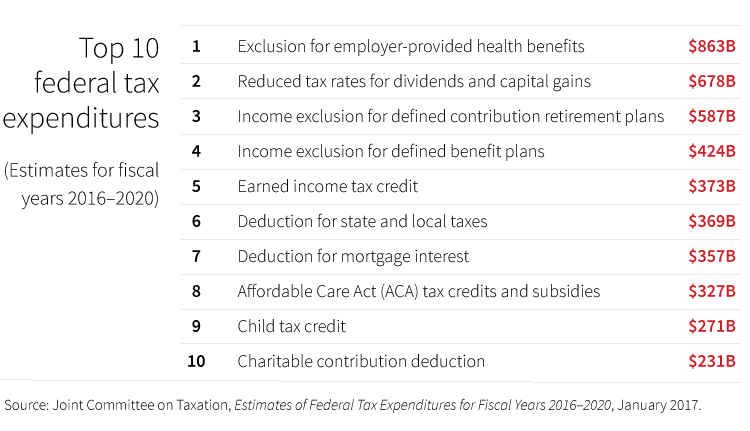 For example, how much additional revenue the federal government could expect if the tax deduction for mortgage interest was eliminated. The estimates are used by lawmakers as they consider various tax proposals. In the past, budget hawks have pointed to these items as a source of revenue in attempts to lower the federal deficit. While the JCT ranks the items by dollar amount, not all of the tax expenditures have the same impact on government revenue. For example, the JCT projects to lose $587 billion in revenue over the next five years due to the tax exclusion for defined contribution retirement savings plans. However, the analysis doesn’t account for the fact that this income is not entirely lost. Contributions are tax deferred until the owner withdraws the funds from the account. At that time, the distribution is taxed as ordinary income. Taxpayers are anticipating that tax reform, along with government infrastructure and other spending, will be priorities in the new administration. As Congress engages in budget debates, if there is a need for revenue, any of these items could be considered for possible adjustment or elimination. It is important for investors to monitor the tax landscape with an advisor to determine what, if any, implications emerge for their investment and financial plans.